For those who stream video from online sources, the speed at which data can be sent into their home is critical. If your connection isn't fast enough, streaming video can sometimes stall as it fills the buffer in the receiving device, or the content provider might send a lower-quality stream because it senses that your available speed can't handle anything more. What many refer to as "Internet speed" is actually the bandwidth available to accept data from the Internet into your home. Measured in megabits per second (Mbps), it's the amount of data that can be transferred from "the cloud" to your connected devices in one second. For years, I lived in a rural area. We were excited to get DSL with speeds over 1 Mbps. At that speed, a standard-definition Netflix movie would stall and buffer or freeze altogether. Now, I live in a town that has broadband cable with a ridiculously fast top Internet speed of 100 Mbps. Currently, no video streaming requires anything close to 100 Mbps. But all of the Internet-connected computers and devices in your home network share the total bandwidth you're paying for. Some of the bandwidth might be used by others in your home who want to stream to their TV or play online games. Also, if your neighbors subscribe to the same cable provider or share your building's overall bandwidth, that can decrease the bandwidth you have available if they all want to stream at the same time. As you'll see below, even a huge video file with 3D and 1080p resolution and Dolby Digital Plus audio requires less than 10 Mbps. Still, if you want to stream 3D or 1080p videos, I recommend opting for an Internet speed of at least 20 Mbps. This takes into account that others might use the Internet at the same time. At 20 Mbps or more, video streaming of most content will usually run as smoothly as live TV. Yet, several factors could still cause the video to stall and buffer. Popular streaming services could have too many people trying to access the same video at the same time. Perhaps you're streaming in the evening when demand for bandwidth is high in your neighborhood, or others in your house might also be streaming HD content. If you have an older router with limited bandwidth capabilities, your streaming device might not be receiving all the bandwidth it needs. This is especially true of WiFi connections, which can also be problematic because of interference from other wireless devices in the home. If router is more than three years old and want to stream video, consider investing in an AV router like Netgear's WNDR 4500, D-Link's Amplifi, or Western Digital's MyNet900. Netflix, Hulu Plus, and many network-TV streaming sites will automatically test your Internet speed before a video begins streaming. Based on its determination of your speed, it will deliver the best video qualityfrom standard definition to 1080pthat it thinks will run smoothly on your computer or device. Vudu gives you the option of manually testing your Internet speed before renting or buying a movie, as shown in the screen shot above. You don't want to pay more for a high-quality video only to have it stop because your Internet connection isn't fast enough. To test your network speed, go to the "My Vudu" tab and click on "Info & Settings." Choose the Network test and run the test to see what speed Vudu recommends for your player. If you do rent a high-quality movie and it repeatedly stops to buffer, a message will appear offering to downgrade the quality of the movie you are watching for smoother video streaming. Note: If a TV show or movie repeatedly needs to buffer, Hulu Plus will stop streaming the video and recommend that you downgrade the video quality. Note: All Vudu movies are streamed with Dolby Digital Plus 5.1 audio. One thing is certain: Our need for faster speeds will continue to grow. Perhaps we will be streaming 4K video sometime in the future, or we'll need more bandwidth for high-resolution audio formats. But just as dial-up speeds were less than a hundredth of the speed we need today, we will find uses for gigabit Internet speeds in the not-too-distant future. I too am one of those poor lost souls who live in the land of clear air and crummy bandwidth (at great expense too, I might add). The question is, what can be done either as an induvidual or as a nation? Personaly my company owns the lines so my DSL is at thier mercy, no ugly competition for my service will ever ruin thier day. Would a satellite connection get me what I want at a price I can afford or should I call my congresman to try and inject a little capitalism into my internet purchaes? I don't know all the particulars of your situation of course, and yous service may just be terrible. But to anyone who is suffering from bandwidth issues, I would suggest making sure there is no bottleneck on your end. We were paying for 20mbps cable service, but the best I could ever measure was 10-12mbps. Well, once our old "G" router died, and we bought a new "N" router, we suddenly were getting all the speed we paid for. The router was a bottleneck. Just food for thought. Hope things improve for you by any means. HughesNet is a satellite-based ISP for people in rural areas. I took a look at their site, and the best speed I could find was 2 Mbps for nearly $110/month...pretty slow for that kind of money. I'm afraid I can't see any reasonable solution for you; I doubt that calling your congressperson will do much good, at least in the short term. I didn't know about ViaSat; sounds like a much better alternative to HughesNet. But how much does it cost for 12 Mbps? What is the data cap, if any? I get 1.5Mbps on a good day, thats it. I do have a bundle with a landline and the crummy DSL, costs like $95/month. I just hope Bluray doesn't die a quick death because all you townies decide downlaoding is the only way. Don't get me wrong, I like the idea of instant downloads for certain programing, but my movies need to shine on my ten foot screen. I assume your data caps are 150 and 250 GB per month; 15 and 25 would be very small! Nope, 15-25 Gb. Not enough, but about the best available. Beats a 2-4 Gb 4G plan. I have pretty descent download speed at 16 Mbps on average. When I watch movies on Vudu in the afternoon, there is no problem of streaming HDX quality. Not once there is a buffering issue. However, there is always a problem at night. Internet use does not change in my house at night. So is there a problem at the Vudu site? It might be that too many people are trying to access the same movie? Whatever the case may be, there always seems to be a problem at night.. What are my options? Do you get your Internet service from a cable company? If so, a certain amount of bandwidth is shared by you and your neighbors, and if more of them are online in the evening, that could be the problem. yeah, it's through comcast. Need to look into changing it then. Speed needs to take in account available bandwidth and latency. 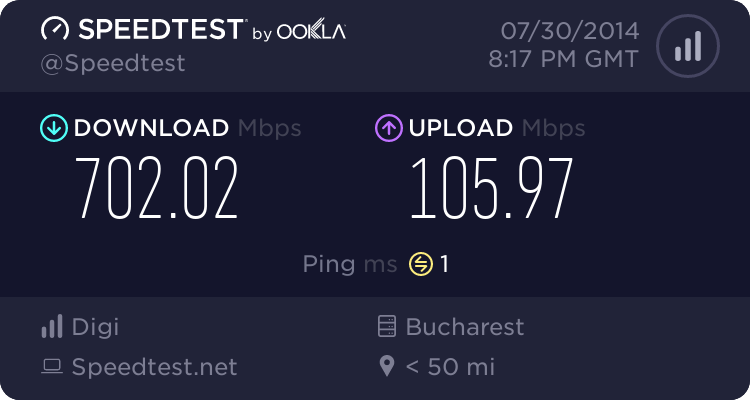 Bandwidth is meaningless if latency is high (or you have a heavily used shared connection like can happen with cable modems). Further Satellite internet services by definition have very high latency (your data comes from space). To use a better analogy: You could be driving a Ferrari, but if there is a stop sign every single block, your car won't be driving any faster than a Prius. Does any one else see this. I have a 10 Mbps package with my ISP and a speed test verifies that I am getting that (or mostly getting) and this should be more than enough to stream 720p from the BBC. However when I watch HD a few minutes into it buffering ad stuttering starts and then the BBC tells I don't have sufficient band with to stream HD. A quick speed test tell me then that I am down to 1 Mbps. It feels like my ISP is penalising me for streaming even tho when I checked with the Help desk they said they weren't. You may lose the connection and get a message....loading.. Fiber Optic the whole USA with the Fed Gov paying. Like they do in South Korea and Japan. As I understand it our speeds are crabby because our capitalist model only allows for a monopole or 2 providers.